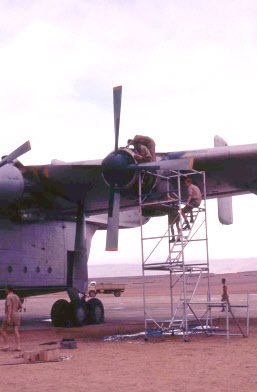 ABOVE: XM108 in for repair at Riyan. These photos were taken at Riyan in late 1960 or early 1961. The Bev was due to over-fly us, but had engine trouble, and being unable to feather the prop, the pilot chose to make an emergency landing. It was late afternoon, so they stayed the night and a relief aircraft came the following day with a repair crew. During that night it rained for the only time in the 12 months I was there, hence the cloudy sky. ABOVE LEFT: The problem engine. 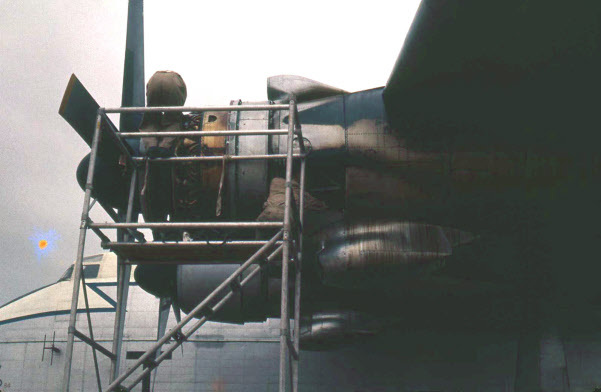 ABOVE RIGHT: Repair crew at work. I was a junior tech Ground Radar Fitter, spending much of my “working hours” in the control tower. I was told later that the pilot, or possibly that of the relief A/C, wanted to fly back to Aden on three engines but no one would sign the F700.